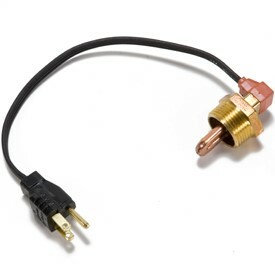 Attached to the engine cylinder block, the engine coolant heater plugs into a 120-V electrical outlet to warm the engine for fast cold-weather starts. NOTE: It is recommended to install optional engine coolant heater, transmission oil heater, and battery heating pad (A22400P - ordered through A and I) if operating machine in temperatures below -18 ⁰C (0⁰F). 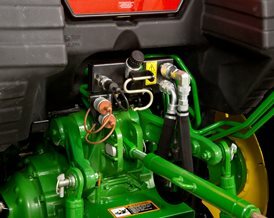 When ordered with the loader, the tractor is equipped with a loader mounted hydraulic valve. 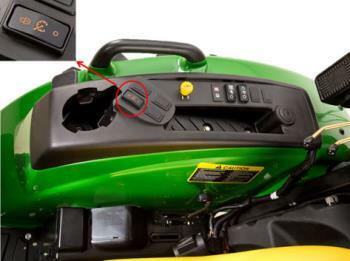 NOTE: Power beyond cannot be installed without a D170 Loader. 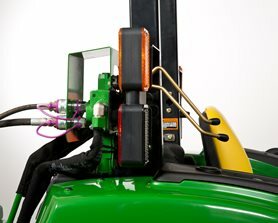 Allows routing to the front or back of the tractor, allowing operation of three SCVs in the front and rear of the tractor. 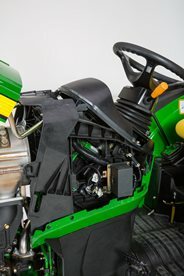 This attachment allows for the installation of the dual mid-valve kit on 4M Tractors. 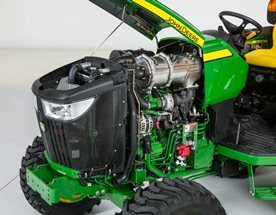 With this kit, 4M Tractors can utilize various implements, such as the 440R Loader, as well as other hydraulically-driven implements. 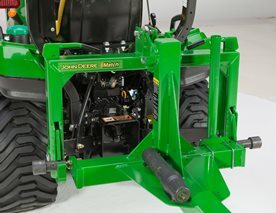 This kit allows the 4M Tractor to operate hydraulically and function similar to the 4R Open-Station Tractors. 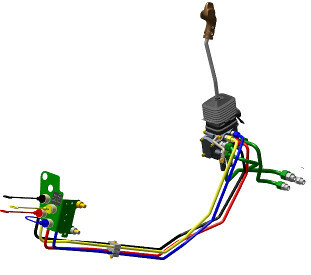 The kit contains the dual mid-valve, loader joystick, hydraulic lines, and all fittings / hardware that is required. 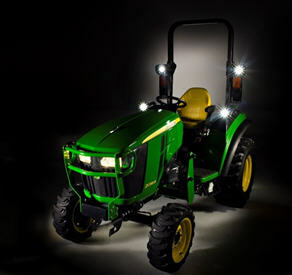 This kit provides light to the rear of the tractor for evening work. 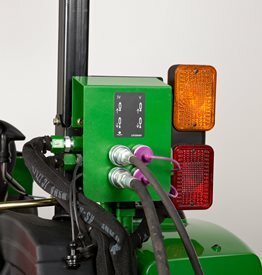 For open-station tractors only, this kit contains individual light. NOTE: Kit includes one rear light. 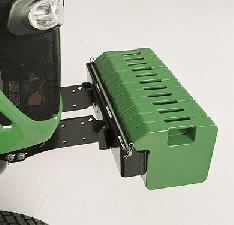 NOTE: Both the rear- and forward-work lights are compatible together and with the light-brush guard kits. 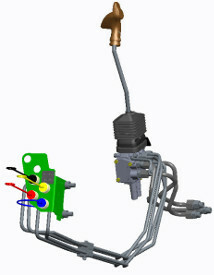 The light kit contains a two-to-four pigtail that plugs into the main harness, as if only plugging one set of lights, providing two sets of plugs to use for forward and rear-work lights. 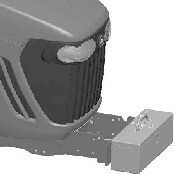 The forward light is installed on top of the brush guard, and the rear light is installed inside the ROPS using the bolt holding the light and brush guard on. 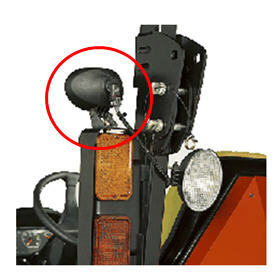 NOTE: For 102E3 and 1026R Tractors – kit interference during backhoe operations (mounted inside ROPS) – use LVB25546 forward-light kit as an alternative. The forward-lighting kit provides extra visibility when working in dark conditions. 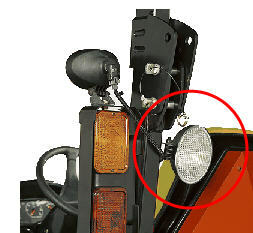 Lights attach to the brush guards located on the rollover protective structure (ROPS). Each kit contains two lights. NOTE: Requires BLV10400 warning light brush guard kit and LVB26026 light kit harness. 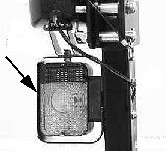 Not compatible with LVB25547 rear work light kit (1023E). NOTE: Requires BLV10400 warning light brush guard kit. Not compatible with LVB25547 rear work light kit (1025R, 2025R, 2032R, 2038R, 3025E, 3032E, 3038E, 4105, 4044M, 4052M, 4066M). NOTE: Requires BLV10620 premium warning light brush guard kit. Not compatible with LVB25547 rear work light kit (3033R, 3039R, 3046R, 4044R, 4052R, 4066R). 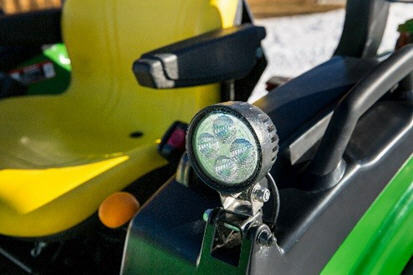 An optional LED work light kit is available for all open-station compact utility tractors. 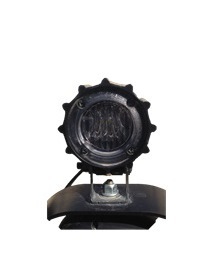 These lights provide extra visibility when working in dark conditions and have 180-degree rotation to face forward or backward. 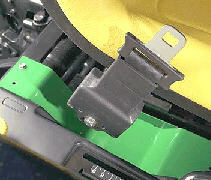 The kit contains two lights and the mounting hardware required for installation. 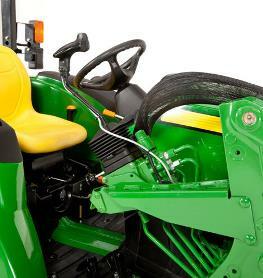 This lighting kit is mounted to the warning light brush guard kit, which is mounted to the ROPS and requires attachment BLV10400 for installation. 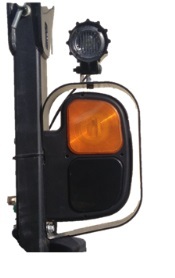 The halogen work light kit attachment is still available (LVB25546). 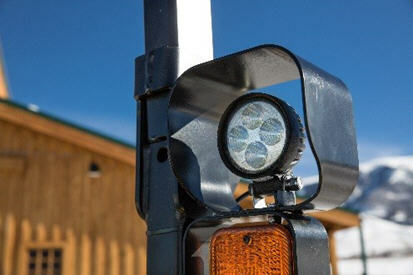 ROPS warning-light brush guards protect turn signal/warning lights from damage caused by low branches on trees. Two guards included in each kit. 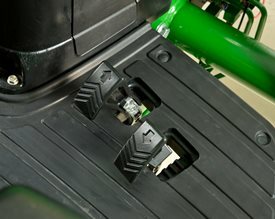 The connector kit is useful for applications where auxiliary power is needed: turn lights, work lights, tail lights, auxiliary power, and chassis ground. 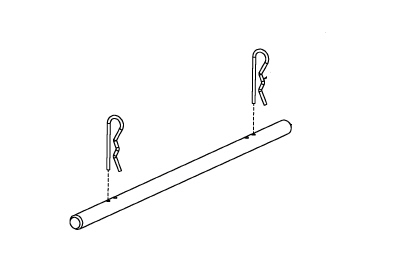 NOTE: LVB25960 trailer connector kit for open-station models is backward compatible. 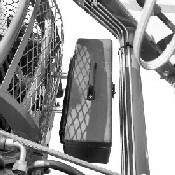 The backup alarm is an audible alarm that informs operator and bystanders when unit is in reverse. 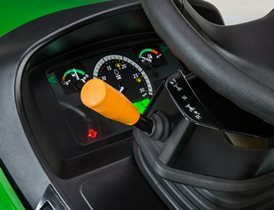 For cab and open-station tractors. NOTE: Requires eHydroTM transmission option. 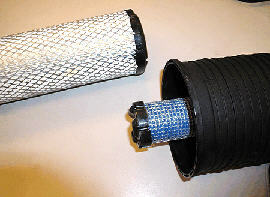 Filter Paks are a handy and convenient way for dealers to supply a customer with the maintenance-interval parts as specified in their operator's manual. 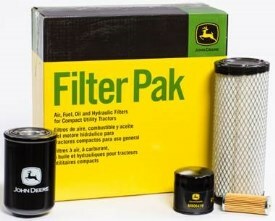 These kits contain an oil filter, air filter, fuel filter and hydraulic filter, offering a complete solution for all your customers’ maintenance needs to keep their tractors running at peak performance. 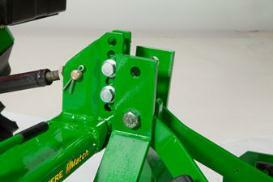 Rod and pins that allow weights to be bolted together to remain on tractor. 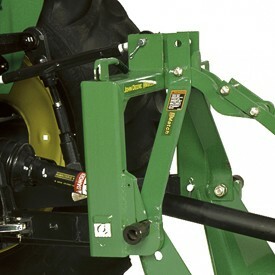 Can be attached to tractor to allow using up to 12 front weights. 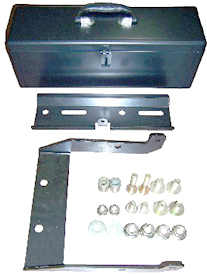 Extension kit includes extension bracket, hardware, rod, and pins. NOTE: Front weights and front hitch are not compatible on same tractor. A horn provides audible alert to bystanders. Allow 20 minutes to install. Provide added traction in snowy and icy conditions. 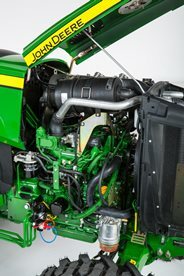 Toolbox is designed for installation on all 4000 TWENTY Series Open-Station and Cab Tractors. This handy toolbox kit provides easy access and convenient storage for tools. Provides the operator the necessary shade and protection from the elements. The canopy attaches to the rollover protective structure (ROPS) to protect the operator from inclement weather. 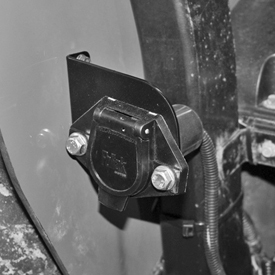 NOTE: Additional mounting brackets are required to adapt the canopy (LVB25334) to ROPS. See ordering information below. The canopy attaches to the open operator station rollover protective structure (ROPS). The 1613.2-mm (63.5-in.) long, 1322.7-mm (52-in.) wide ABS canopy can offer protection to the operator from inclement weather and direct overhead sunlight. NOTE: Deluxe canopy (LVB25785) includes additional headliner and marker lights for select open station models and also requires LVB25332. NOTE: In the picture above, you see the bushing set. These bushings allow the hooks on the iMatch and the pins on the implement to fit together properly. All other implements (box blades, tillers, rear blades, etc.) 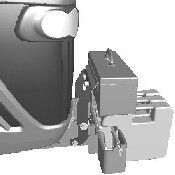 will require a set of bushings to enlarge the pin to fit with the iMatch hooks. Bushings of different lengths can be found in the parts system or through a bushing supplier (see dimensions below). Inside diameter: 0.88 to 0.89 in. 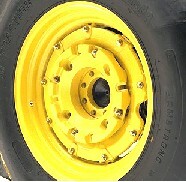 Outside diameter: 1.43 to 1.44 in. 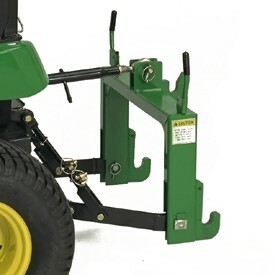 Bought this to work on my ranch and around my other property. Use it for shredding, box blading, rock raking, and wood chipping. Havent had any issues doing what I needed to do within reason. Added some lights and a canopy and can work day or night. Have a little over 200 hrs on it and so far so good. 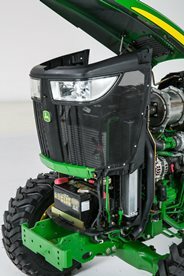 Keep the dust/grass clippings out of the radiator to keep the temps down, they build up fast when its dry like it has been lately. Bought a woodmax 8800 chipper and it runs it perfectly. The 4wd keeps moving when box blading, cant imagine not having 4wd. My brother-in-law has a 3038 and although he loves his he mentioned the huge power difference between the two. Oh another must, bucket teeth. If you want to do any real digging, gotta have them. 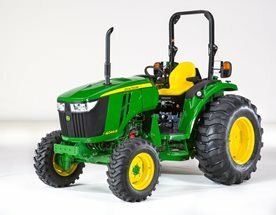 This is my first tractor, so take this review for what its worth, but I am VERY happy with my purchase. I love this tractor. I was used to using a Bobcat, which I loved to clean my horse pen. 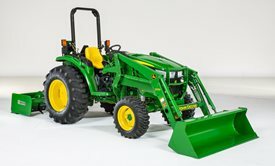 My husband, seeing me climb in and out, took me to our JD dealer where he had looked at compact tractors. I drove the 4044M and loved it. Everything is sooo easy to access and get on and off of, the quick change features are simple. Literally takes me 3 minutes to take the loader off and put the bale spear on. Easy to manhandle with female hands.